Guilford College in Greensboro, North Carolina. Simon interned on Guilford's farm his sophomore year, inspiring his studies in agriculture, food justice, and social justice. This experience led to his involvement with the Youth Farm Project for 5 years, where he started in its first year as part of the summer program, eventually becoming a crew member, a crew leader, youth coordinator, and the assistant farm manager. ​Rayna has lived in Ithaca for her whole life. 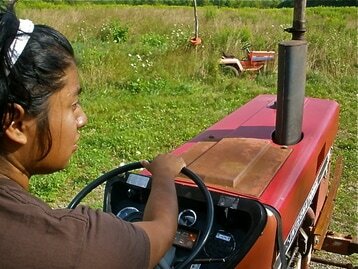 While attending LACS she was inspired by the “Localvores” group, and began working at the Youth Farm during the 2012 summer program as a crew member. Rayna continued her work on the farm through 2013, eventually acting as the youth and market coordinator in 2015. Rayna organized the construction of the Youth Farm’s mobile market stand as her senior project. Rayna is currently attending the College of the Atlantic in Bar Harbor, Maine, where she is focusing on the connection between sustainable agriculture, environmental sciences and social justice.